This weekend, on Friday March 1 and Saturday March 2, the 2019 EST/Sloan First Light Festival will feature two workshop performances of Susan Bernfield ’s sparkling new play SIZZLE SIZZLE FLY, a drama about Frances “Poppy” Northcutt, the first female engineer to work in NASA’s Mission Control. SIZZLE SIZZLE FLY had its first public reading in January 2017 as part of that year’s First Light Festival. A child of the sixties herself, Susan has lots to say about Poppy. SIZZLE SIZZLE FLY is your new play about Frances “Poppy” Northcutt, the first woman engineer who worked in Mission Control at NASA and who played a critical role in configuring flight trajectories for Apollo 8 and other Apollo missions. What prompted you to write this play? Flipping through channels one night (so old fashioned!) I landed on an episode of the MAKERS documentary series that was about women in space. Poppy Northcutt was in it, along with these awesome pictures of her during her time at NASA. She helped Apollo 13 get down, but she sure wasn’t in the movie! I’ve always been obsessed with the space program; I think most people who were little kids in the late ‘60s are. My standing image, of course, was row after row of uniform-looking guys: the glasses, the white shirts, the pocket protectors. Poppy – not just a woman but a young and super-fashionable woman – utterly disrupted that image for me. Even consciously inhabiting a feminine stereotype, she still could break all the stereotypes at once. I had this near-Robert-Wilson-style vision, a long line of identical guys with Poppy in her headset suddenly entering their line. The play has grown around that image. What kind of research did you do to prepare to write the play? There’s some serious math involved in calculating orbital trajectories. How deep a dive did you take into Northcutt’s work product? Thanks for liking my math! It’s probably pretty surface-y, though I did read many (simple) articles about orbital mechanics, Fortran, early computers. I didn’t understand much but I loved using the vocabulary, I find it delicious and oddly lyrical. Mainly, I dove into the organizational systems and work culture at Mission Control, which is central to the play and, as I discovered, a secret of NASA’s success. The NASA website has an incredible trove of oral histories with engineers, supervisors, employees, and I read dozens of them. Actually, first I watched on YouTube some really stylish films made to promote the Apollo program. Their look and sound has influenced the play a lot, but more importantly there was one that described what I took to be Poppy’s division, so I looked up the division chief featured in the film and read his oral history. When he mentioned other people – I’d go read their oral histories, too, and so on, following a trail of names through these documents, occasionally hitting on a fact or anecdote that helped me piece things together. I also watched documentaries and read many sources on Apollo 8. There was so much I didn’t know about it, certainly how fast it was planned and prepped, and it has so much poetic value – the “saving” of 1968 on the cusp of a changing world, earthrise. And the first thing I read was an oral history Poppy did for the Houston Public Library, it’s the source of the core ideas in the piece but had limited details, sending me on the goose chase described above. Northcutt got a lot of press attention in 1968 and thereafter as the “lithesome blonde” who sported miniskirts even while she held her own among the nerdy NASA engineers. In later years, after earning a law degree, she actively worked with the National Organization for Women to defend women’s rights. Is it your sense that she was a feminist from day one or did her consciousness evolve on women’s issues? Frances "Poppy" Northcutt at her terminal. She’s said that her time at NASA was her consciousness raising and the play tracks that evolution. She didn’t want any woman to ever have to be the only woman again, so she got involved. She was very honest about using what we’d now probably call her privilege. She figured she had a good income, she was prominent, she wasn’t going to be fired, so she could safely put herself out there for women for whom activism was risky, but who needed the progress the women’s movement promised. I love that. 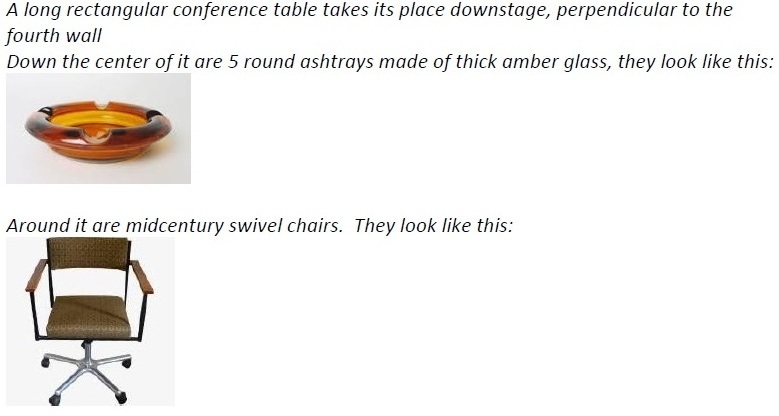 In your script you include many specific references to artifacts of the time – chairs, computer screens, lamps. How important are these elements to establishing the context for the world Northcutt inhabited? It’s a very visual play. As I said, it started with an image, it repeats that image and builds in more. I see just a few iconic items on stage, and I’ve tried to activate them: the swivel chairs, for example, produce a kind of dance. In addition to establishing the world, for me these items are a clue to the theatricality, it’s a memory play and a non-naturalistic play, and picking a few iconic items and images lets me pull ideas into focus. At some point I started inserting pictures of objects into the text on the page: “it looks like this.” Having them right there inspired me, once I could see the chair or the lamp I could inhabit what was happening around it. Then I decided I wanted EVERY reader to see them. It put me right in it, wouldn’t it be the same for others? I had such a great time writing this play, I felt freer than I ever had before, so I just figured, why not, and I loved how it made my page come alive. Sound and music, especially jazz, play a significant role in the play. Will the workshop be doing anything special with sound? Space and the ‘60s are both so sonically cool. The sounds, specifically integrated with the text, also assist the spare and iconic theatricality I’m looking for. It was amazing, and frankly just the right move, for the EST folks to invite me to include sound design in this workshop. Sound designer Kate Marvin and I got together in September to play around with some of the bigger sound moments in the play (well, more than we expected to, once we got going we just wanted to have at more of ‘em!). We had such a great time. There’s a big dream of sound in this text, I just heard soundscape throughout when I was writing it, sometimes it’s something literal and existing, and sometimes in stage directions I tried to articulate the FEELING or the acceleration or emotional underpinning the sound should convey. What Kate came up with, the sounds we explored together and then she constructed into sequences, concurred with and often improved on what I’d been dreaming. There’s one spot where I’d tried to describe the feeling of a piece of music in words, and she showed up with the exact piece I’d been thinking about! Plus mainly we giggled. Including when we came in to play Linsay and Graeme what we’d been up to. And now, being in this workshop week with Kate’s work to play with and for the actors to respond to… it really is an essential element, it’s illuminating and is punctuating the play just as intended, and it’s just really exciting. Katherine Johnson (left), the "computer" portrayed by Taraji P. Henson in the movie Hidden Figures. In 2016 we had a cascade of books – and one noteworthy film – about women who worked on the ground in the space program: The Glass Universe: How the Ladies of the Harvard Observatory Took the Measure of the Stars by Dava Sobel, Hidden Figures: The American Dream and the Untold Story of the Black Women Mathematicians Who Helped Win the Space Race by Margot Lee Shetterly (in 2017 a popular and critically acclaimed film), and Rise of the Rocket Girls: The Women Who Propelled Us, from Missiles to the Moon to Mars by Nathalia Holt. What do you think accounts for this sudden interest in these women behind the space program? If you’ve read any of these books, how do the stories told in them compare with Poppy Northcutt’s? If you saw it, what did you think of the movie Hidden Figures? Wow, I didn’t know about those other books, both were published after I handed my play in last year! I’m not surprised these stories have become popular, with so much interest in technology now I’m sure there’s curiosity from all possible angles. I did see the movie, Hidden Figures, it’s so good, and I’m thrilled that it became, what, the number one movie in America several weeks running? Because she invented the math, as the movie says, Katherine Johnson came up a lot in my research. It was amazing to discover her. Poppy did many remarkable things, but hundreds of men at NASA had similar functions, and the play is about the experience of being alone in that crowd. Obviously, being African-American in Virginia adds an immeasurable layer of difficulty. Poppy was a native Texan in Houston, she presented very assertively, and from what I could tell pretty much spoke her mind. Once she proved she could do the job there weren’t many outward obstacles; like in the movie, they needed all the smart people they could get. But she was always, in her words, a curiosity. I did all this fascinating research, but pulling a story out of it, trying to find the drama in some pretty subtle slights and pressures, was challenging, I was stumped for a while. Can she penetrate the men’s camaraderie? Seems like a small question, but in a work environment in which teamwork is the established mode of productivity, and the results are life and death, the stakes are pretty high. Or I hope so! Poppy Northcutt in a 1969 ad in Time Magazine for her contractor, TRW. Northcutt played a critical role in another Apollo mission, when an explosion aboard Apollo 13 forced the astronauts to abort the lunar landing and put their return in jeopardy. Can you explain what NASA called upon her to do? She calculated new return-to-earth trajectories – among other things, the explosion put Apollo off course, so hundreds of thousands of new trajectories had to be run in order to get the astronauts home. In addition to EST/Sloan, you have developed and produced plays at New Harmony Project, People's Light & Theatre, Huntington Theatre Company, Eugene O’Neill National Playwrights Conference, The Lark, and many other venues. How does the play development process at EST/Sloan compare with or differ from these other organizations? I’ve gotten so much out of every opportunity, but they were always for existing plays. I usually make time for and incentivize writing myself, and it’s usually the last thing I get to with so much else going on. So this commission has meant a lot to me. A deadline! I took it very seriously, and I couldn’t believe how different that felt or how productive that made me. I worked more consistently than I ever have on a play, I planned my time out, I created task lists, I did all this research, I forced myself to keep going when it felt overwhelming or dead end. I sent it in at 3 pm on the deadline day we’d set and I was ridiculously pumped, so excited. It’s great to know Linsay and Graeme will read it, to have their feedback. They invited me to SPACE on Ryder Farm in the summer of 2016 to turn the first draft into a second one, so productive. After shepherding so many science plays, their advice is unique and specific. When I was stumped, Graeme said, your characters are working. Just let them do their work. And I did. And that’s how I figured it out. Portions of this interview appeared previously on this blog as part of the 2017 First Light Festival. The 2019 EST/Sloan First Light Festival runs from January 28 through March 2 and features readings and workshop productions of ten new plays. The climax of every EST/Sloan season is the annual Mainstage Production, which this year was the world premiere of BEHIND THE SHEET by Charly Evon Simpson. Directed by Colette Robert, BEHIND THE SHEET confronts the history of a great medical breakthrough by telling the forgotten story of a community of enslaved black women who involuntarily enabled the discovery. Previews began January 9 and the show runs through March 10. Tickets can be purchased here. The First Light Festival is made possible through the alliance between The Ensemble Studio Theatre and The Alfred P. Sloan Foundation, now in its twentieth year.